There is an interesting contracts controversy brewing over at the Smithsonian. Yes, it is possible to have an interesting contracts controversy. In this case, the contract was signed in 1948 between the estate of Orville Wright and the Smithsonian. The contract required that, in exchange for the famed Wright flyer, the Smithsonian would never recognize that anyone else was first in flight. That does not sit well with historians who believe that the first in flight was actually German immigrant Gustav Whitehead. Putting aside the historical debate, a contract requiring the museum legally to deny historical claims is plainly unethical. Is it an unenforceable unconscionable contract? The question is whether this contract with the Wright family is enforceable. For example, the family could demand the plane back if the museum denies the required claim. The conflict presents a curator’s version of the “Rule Against Perpetuities” in property. That analogous rule in property states that a will cannot limit “future interests that do not vest within the time permitted and “limit[s] the testator’s power to earmark gifts for remote descendants.” In this case, the museum was given ownership for $1 but the family could claim that the sale was invalidated by the continuing condition. Even if this were true however it would be better to lose the plane than the integrity of the museum. My guess is that the Wright family would be responsible if asked to waive the condition. At least I hope they would be. If not, I would as interested to see the contract put on display in place of the plane. I believe that you just could do with a few percent to pressure the message home a bit, however instead of that, this is magnificent blog. 1. Whitehead did fly repeatedly in 1901-1908. It is a false statement that he stopped flying, perpetrated most often by Smithsonian, which can be relied upon for false statements in all things concerning “first flight”, for the past 100+ years. Why should they stop now? No acountability for them, yet. 2. Orville Wright and his close, highly placed friends had been fighting the Whitehead claim for the previous 13 years, ever since Stella Randolph published several articles and a book about Gustave Whitehead in the 1930’s. A collusion between Wright and his buddies produced the heavily biased Orville Wright article on Whitehead “‘The Mythical Whitehead Flight”, published in U.S. Air Services magazine in 1945. 3. Since Wright was well-aware of the threat to his personal stake in being named “first in flight” (ahead of his brother who actually had the only flight recognized as successful by the Wrights and others they influenced, of the first decade), he and his heirs saw to it that Whitehead and all other contenders would be prevented from recognition, in perpetuity, in order to keep the Wright Flyer. It was definitely NOT just because of the Langley claim. They were killing all contender birds with one stone, including the strongest, Whitehead. 4. Much more sordid conduct went on behind the scenes with the Wrights, from 1903 forward, to stake their claim on “first in flight” which brought them broad patent rights and nearly a world monopoly on aviation, which is what they sought. There is less to authenticate whether the Wrights flew Dec. 17, 1903, than there is to authenticate whether Whitehead did two years earlier. What the Wrights said themselves really carries very little weight.Their witnesses would carry more. Out of five witnesses, two said they started from the hill and another was just a kid who didn’t know what was going on. Starting from a hill and lifted by a 27 mph head wind invalidates the Wrights’ flights in 1903 and they obviously knew it. Besides, their plane was not sustainable or controllable, even by the Wrights’ accounts. As for the Langley trials, there will be information coming out to verify that the Smithsonian’s belief that it was capable of flight prior to the Wrights is more accurate. 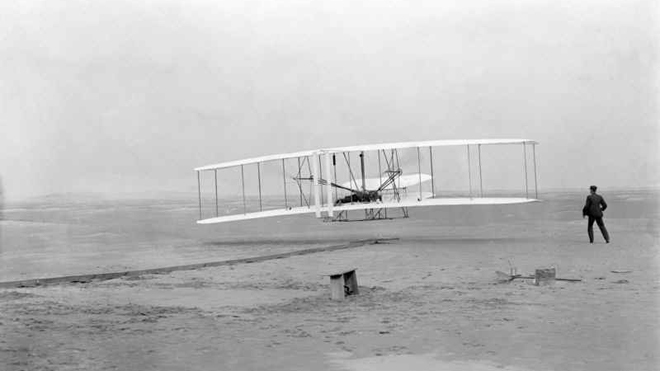 Note that the Smithsonian never said the full size Langley model actually flew in 1903, only that it was capable. There were two (only) accidents in launching, which didn’t/don’t invalidate the Langley plane itself. The Smithsonian lost its integrity when it caved to the Wright/Brewer extortion-like act of sending the “Wright Flyer” to England by publishing a paper, listing modifications made in the Langley plane when Curtiss flew it in 1914. The paper, written essentially by Wright and Fred Kelly, was deliberately misleading. It implied that the plane couldn’t have flown without the Curtiss modifications. Actually, the modifications didn’t invalidate the Langley plane–they actually helped prove that it could have flown. Re-visit your history–go back to the sources. The 1948 contract was very much an outgrowth of the Langley claim, if you’ll bother to connect the dots.